The news that we reported on our Facebook page and Twitter feed three weeks ago concerning the pending sale of NZ art print publisher Image Vault has today been officially confirmed via email to all their stockists today. As most of you will already know, from July 1st Image Vault will be under new ownership. Due to an unfortunate glitch in our system, we were unaware that this formal notification had not been made, so we apologise profusely if this news had not already reached you! The new owners are Nicola and Carl Church - and they are so excited to be embarking upon this new adventure! 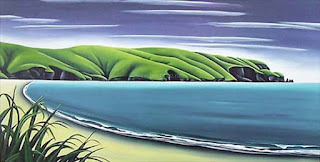 They bring fresh energy and ideas, and are hoping to meet with you at the Auckland Gift Fair in August. Many of you have been our loyal customers for many years, even dating back to our start in the top floor of Windsor Gallery! We want to acknowledge and express our gratitude for your support - it is your encouragement and feedback that allowed Image Vault to grow into the company it is today. Jane and Nathan will continue their association with IV by advising on product development and design, and Hamish will be on hand to ensure as smooth a transition as possible. Again, a huge thank you to you all. Nathan Secker, Jane Secker, Hamish Bayly"
from our building in Hereford St to collect the first bundles of prints. Image Vault had a great run with prints by artists such as Grahame Sydney and Diana Adams, riding the kiwiana art boom with prints like the Sweet As series by Jason Kelly whilst making the transition from offset printing to print on demand. We wish the new owners the best of luck and look forward to promoting all the new artists and artworks they will publish in the future.